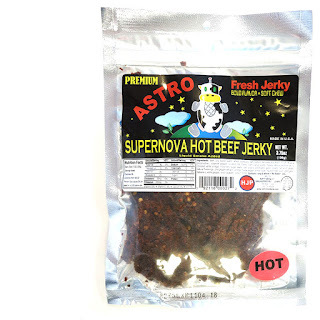 Astro Fresh Jerky is a brand owned by HJP Trading, LLC based out of Los Angeles, CA. It was started by Roy Park in early 2015 who found an old family recipe that dated back to the late 1980s. Since then, Roy has been selling his jerky in local markets and retailers in California. Recently they started a website and are now taking online orders. 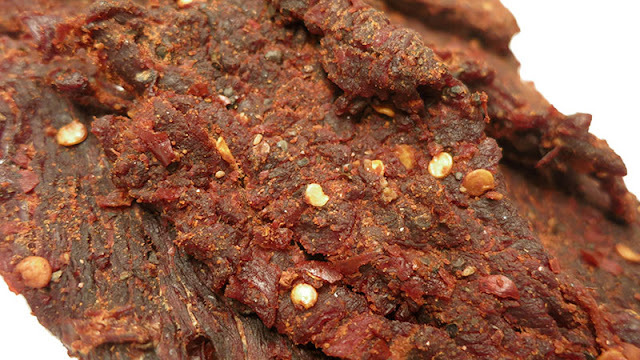 This Supernova Hot variety is one of three hot beef jerky flavors the company offers. Beef, soy sauce, cayenne pepper, crushed red chilies, corn syrup solids, honey, worcestershire sauce, vinegar, black pepper, lemon juice, liquid smoke, granulated garlic, habanero, white pepper, onion powder, sodium nitrite. The first flavors that hit my palate is a light chile pepper flavor and salt. Touches of black pepper and cayenne become noticeable soon after. The chewing brings on much of the same flavors, while the heat builds up. There's a faint natural meat flavor towards the end. For being named, "Supernova Hot", it seems to hold up. It definitely does get hot over several chews. I'd rate this as "hot" my personal heat scale, (level 5 out of 5). I'm sure much of the heat comes from the habanero ingredient, but I don't taste any of the unique habanero flavor. It's mostly a lot of heat. Otherwise, the primary taste profile is lots of heat with a flavor reminiscent of chili powder and red chile flavor. There's some black pepper noticeable, a little bit of salt, and faint bits of natural meat flavor. The meat consistency feels dry and moderately chewy. It takes on a meaty feel, but doesn't really chew down like a real piece of steak. It tends to remain dry. There's a light amount of stringiness. 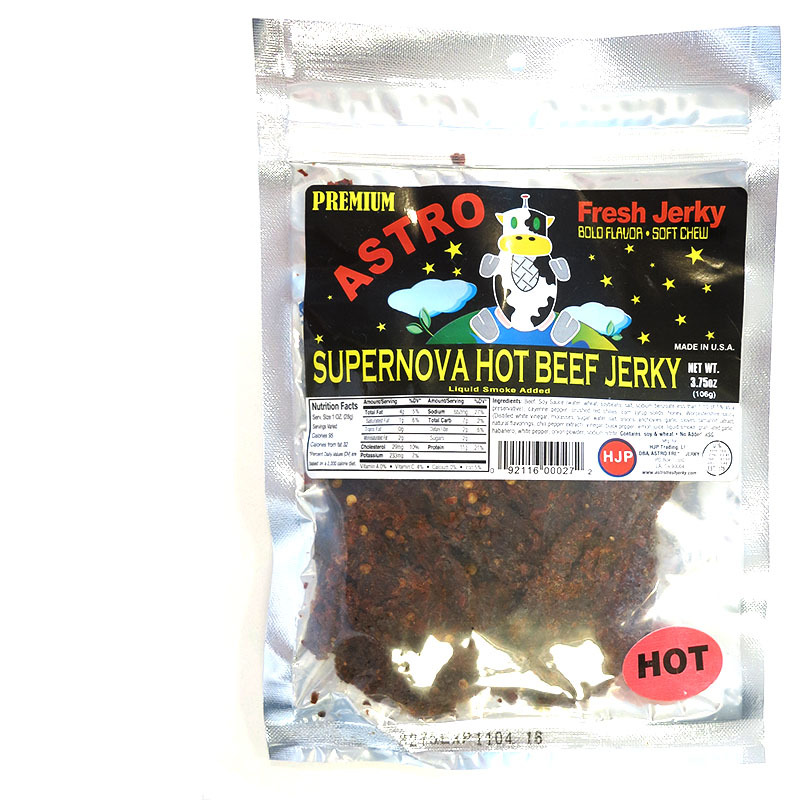 This Supernova Hot from Astro Fresh Jerky definitely delivers a lot of heat, as its name suggests, along with a fair amount of chile pepper flavor, mostly as cayenne and red pepper flakes. Aside from that, I found the overall flavor unremarkable compared to competing brands of heavily red peppered jerky. 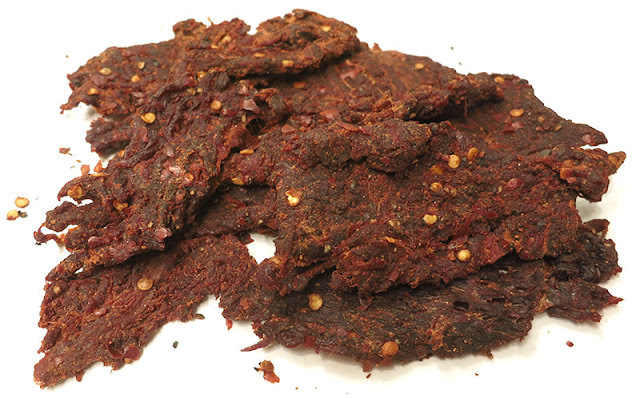 It's a good jerky for heat seekers, who just want the rush that comes with hot chiles, but not necessarily creative in flavor.